Helping you to apply many different diagnostic tools, Diagnosis and Management of Lameness in the Horse, 2nd Edition explores both traditional treatments and alternative therapies for conditions that can cause gait abnormalities in horses. 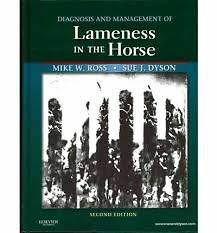 Written by an international team of authors led by Mike Ross and Sue Dyson, this resource describes equine sporting activities and specific lameness conditions in major sport horse types. It emphasizes accurate and systematic observation and clinical examination, with in-depth descriptions of diagnostic analgesia, radiography, ultrasonography, nuclear scintigraphy, magnetic resonance imaging, computed tomography, thermography, and surgical endoscopy. Broader in scope than any other book of its kind, this edition includes a companion website with 47 narrated video clips demonstrating common forelimb and hindlimb lameness as well as gait abnormalities.